While there were plenty of unknowns for our trip abroad, the most concerning thing for me was transportation. For some reason, I couldn’t find a ton of information on the subject which made me uber nervous. Our entire trip revolved around getting from point A to point B in a timely manner and any hiccups could have really thrown a wrench in things. I’m happy to report that we had zero issues despite my heightened anxiety. Phew! So I thought I would recap our various modes of transportation to help those of you who might be making your way to Eastern Europe sometime soon. OK, everyone knows how to book a flight. NBD. I set up a kayak.com alert and watched a few possible arrival cities to see which would be cheapest. I originally wanted to start our journey in Prague, but prices never went down so we ended up flying into Amsterdam, which saved us a couple hundred dollars. I know horrible, right? 🙂 We flew through Iceland, had a short 60 minute layover then took a three hour flight to the Netherlands. The flight was quite comfortable and I never felt like we were seated FOREVER. I bought these tickets (through Icelandair) with no return flight knowing that we’d save some cash booking them separately. Getting from Amsterdam to Prague was another quick flight. The train would have taken us 12 hours and the flight was maybe an hour? Looking back, I should have just bought us the Seattle to Prague tickets as it was about the same cost as our two flights. Oh well! Lesson learned. We booked our return flight with Condor, which I had read HORRIBLE reviews about. I told the hubby to prepare for the worst and it actually ended up being a really great flight (10 hours to Seattle from Frankfurt plus a short two hour flight from Dubrovnik to Frankfurt). The outer rows of the plane were just two seats wide, so we had our own little space to ourselves. They served us two meals plus a snack during our 10 hour flight and we each had our own TV. Economy seating was plenty comfortable for us. I wouldn’t hesitate to book with this airline again. AND a $500 plane ticket from Dubrovnik via Frankfurt to Seattle is like the best deal ever! Trains, oh trains. How I wanted to love you but ended up hating you. Granted, you got us where we needed to go but man, do you have to be so uncomfortable? I had romantic notions of all of these train rides from city to city, but alas night trains are definitely not that. 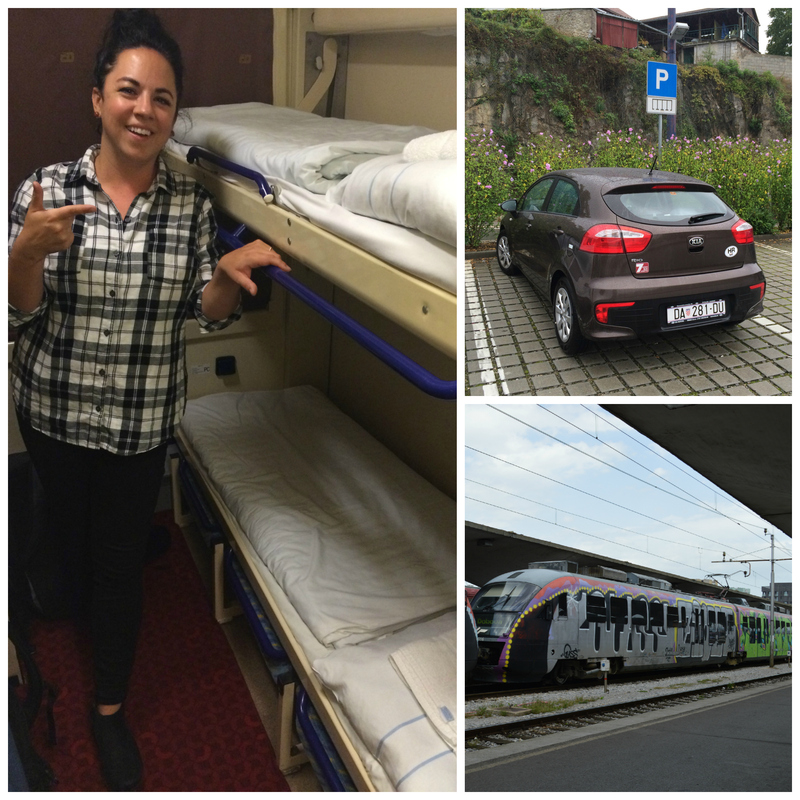 Since we were taking two night trains (Prague to Krakow and Krakow to Budapest), I wanted to be sure we got the cabins we needed so we booked these before our trip. I used this blog to help navigate the booking websites as they were VERY confusing. I also found it helpful to get to the train station early and check in at the counter to make sure your documents were in order. For some reason, we still had a buy a general train ticket even though we had a cabin, which were upwards of $180 dollars for us. A minor inconvenience, but what can you do? The sleeper cabins hold up to three people and there’s a special way you can book them to get it to yourself, which we did. I can’t imagine piling three people in one of those small cabins! The beds are fairly uncomfortable with a thin mattress and tiny pillow, but they keep the rooms warm. Both offered a croissant and coffee or tea in the morning. I found all of the train conductors to be helpful, friendly and English-speaking. You hand over your passport and tickets for the Krakow to Budapest train and they hold them for you the entire night – just an FYI. I know it’s hard to let a passport go, but no worries, it’s safe. We did take one short day train ride from Ljubljana to the Croatia border, which was quite nice and more like I had imagined. I loved seeing the countryside go by! We shared a cabin with a young English couple and had a good time chatting them up. We bought these tickets the day before, but could have bought them the day of and would have been fine. In conclusion, the train system is a necessary evil. Buses were never part of the plan, but after Budapest shut down their station during the initial refugee crisis, we decided it might be wise to have a backup plan. Instead of the train, we took a Eurolines bus from Budapest to Ljublana, which was unfortunately not direct. I think it was $30 per person, which is a steal of a deal if you are looking for budget travel. We spent eight hours on a cramped bus with two border stops since we had to pass through Croatia twice. I think those two stops took up about three hours of that drive time. Lots of on and off the bus and showing passports to border patrol. The buses do stop for bathroom and snack breaks too, but you are looking at gas station eats. We were definitely not in love with the bus, but it was great to have a back-up option. After bus and train rides, it was a major luxury to have a car again. We rented a small two door from Sixt, which ran us $325 for five days. We rented it from Zagreb, Croatia, drove it to Plitvice Lakes and Split, Croatia then to Mostar, Bosnia and finally returning it to Dubrovnik, Croatia. I’d read that Croatia’s public transportation wasn’t super convenient so figured this was a good option for us to cover the most ground. Renting a car in a different country is always a bit stressful, but let me tell you, Croatia is totally easy people! Make sure you have some sort of navigation system and a back-up old school map…oh and maybe some snacks and you are good to go 🙂 Small bills are necessary too as they’ve got some toll roads. Unlike the U.S., people aren’t bumper to bumper commuting all day long. We never ran into any traffic and the main highways were easy to drive on and navigate. Croatians do love to speed though! We crossed the Croatian/Bosnian border twice on our little road trip and I must admit, I had a bit of stress leading up to the first one. I just didn’t know what to expect. Luckily, there was no line and we drove right up to the booth, showed them our passports and were on our way. Smooth sailing! The crossing back into Croatia was pretty much the same, with maybe five cars in line. I would definitely recommend renting a car in Croatia. Having the freedom to just pull over at any time to admire the views is worth its weight in gold. It was the best way to see the country for sure. So what are your favorite modes of transportation when you’re in a new country? Do you like the freedom of the road or is public transportation your jam?